GURPS Dinosaurs – the ultimate sourcebook for introducing the "terrible lizards" of eons past to your roleplaying game! 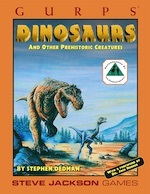 Hundreds of dinosaurs, described with complete scientific accuracy (the book has been approved by The Dinosaur Society!). Take a trip back to a time when the toughest player-characters went by another name – Lunch. GURPS Lands out of Time – A sourcebook for human/dino adventuring, providing all you need to know to place man and giant reptile side-by-side, whether it's a "Lost World" adventure, caveman slapstick, or something in between.